One of the biggest challenges facing landscaping business owners that I talk to is that of generating well qualified leads for their business. Most landscapers rely on word of mouth for sustainable business growth and meeting sales and revenue objectives is rarely if ever enough. With nearly 6 years of experience in the advertising industry and growing up with social media, here are 5 tried and tested, proven tips to drive a landscaping business. Most landscaping and home improvement companies realize the importance of having a website that is visually stunning and shows off the quality of their workmanship. Your gallery and embedding beautiful images and videos within your content can not be overlooked. The most overlooked and important item is the quantity and quality of your content. Media (pictures and videos) will create initial interest but there has to be more meat in your content to convince people that you are a worthy choice to invest tens of thousands of dollars with. You should ensure your website is technically sound in order to ensure that Google will not penalize your website for not complying with the changing SEO rules.If you already have a website then I recommend you have your website analyzed before you start internet marketing to ensure that you aren’t marketing a website not optimized or no call to action. Who doesn’t want to show up first on Google?! The only way to guarantee that your website will appear on Page 1 of Google is by using Pay Per Click advertising through Google AdWords. Google AdWords is easy to use and there are lots of tutorials. Some businesses try it out themselves and find it to be very expensive with little or no results. Just like some home owners try to landscape their own yards and end up making a mess. I would suggest that for good results, work with a company that has the knowledge of working with Pay Per Click services to generate leads. Trying to do it on your own will only cost you a hundreds or thousands of dollars in the long run and usually the results will not be great. The great thing about PPC is that you will only show your advertising to people who are searching for or are interested in your service and you will only pay for it if they actually click on the ad. Once someone clicks on your ad, they need to see something that catches their interest right away, which is why Tip #1 is so important! When working with SEO you want to get business in your local area. You don’t want to travel 100 miles for a customer who saw your business online. For the most part it doesn’t make sense to invest time, energy, or money on marketing to generate a lot of leads outside of a certain radius. Today, Google has gotten so good at zeroing in on a searchers location that it is no longer necessary to type in a location or city name to get local results, but the only way for Google to know that your website matches the location is to tell them that. Your Facebook page is the most important. You should be updating it, sharing photos and stories on a regular basis. Use it as a way to stay top of mind and present but not to constantly be pushing your services and boosting your posts. Another priceless social media tool for landscapers is Pinterest. It’s a great way to show off your work and pin beautiful landscapes you come across with a few comments and a link back to your website. You can provide enormous value to your customers. Not every visitor that lands on your website is ready to sign now. In fact, the majority of visitors are going to be researching, looking for ideas, concepts and other things that will help them identify what they want even before they get to the stage of choosing a vendor for their project. It is worth the effort to create a blog, eBook, or how-to guide that answers your buyer’s common questions. 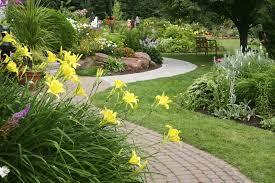 Or perhaps you could gather some awesome landscape designs or ideas that your visitors could download. When you offer this valuable information to someone in the research phase, in exchange for their contact information and email address, you have an opportunity to nurture a relationship with them early on in their buying cycle. Show them good free content before marketing to your customers and clients.